Wild plants that grow in place sultry or planted in pots and the yard as an ornamental plant, grown in areas Many northern Africa and the West Indies. This plant grows on the ground is fertile and loose at the top. Shampoo, drinks, worming, burns, boils, ulcers, tonsillitis, eye pain, sprains, cosmetics, acne. The part that can be used: Leaves, Flowers, roots, fresh consumption. - Seizures in children, malnutrition (malnutrition). 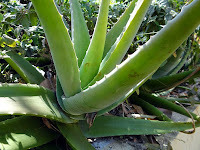 About 15-18cm aloe leaves. Boil, add sugar and drink. Crushed leaves add a little salt, stick it on the boil. 15-30 grams of dried root aloe vera, boiled and then drink it up. 15 Grams aloe leaves washed - squeeze, add 30 grams of sugar. add rice soaking water as needed, then drink it up. 1 Stem aloe washed. dispose of prickly, cut into pieces. Boil 3 glass of water until it becomes one half glass. Drink half cup 3 times a day after meals. 6. Wound up in flames and Minor scalded . 10-15 grams of dried flowers of aloe boiled, then drink it up. or the aloe flower with a white wine (for external use). Sufficient of fresh aloe vera leaf cut. Take the inner part, the form that looks like jelly. Rub on the scalp after a shower in the evening. Wrap with a fabric. The next day wash the hair. Use every day for 3 months to achieve satisfactory results. Half the stems of aloe leaves washed. discard skin and prickly. The contents chopped, and brewed with a half a cup of hot water. Consume while it warm, twice a day . "Pregnant women are prohibited from using this potion. because it can irritate the digestive system and causes diarrhea ". Bitter taste, cool. Anti-inflammatory, laxative (Larative), parasitiside. These herbs get into the meridian heart , liver and pancreas. Aloin, barbaloin, isobarbaloin, aloe-emodin. aloenin, aloesin. Apples for curing the disease - Home Remedies. Avocados for curing the disease - Home Remedies.